Like the other 300 plus communities that Kevin Smith Transportation Group services, Spring Township, PA appreciates the engagement that only a local company can deliver, With operations based across southeastern PA including Berks, Bucks, Chester, Delaware and Montgomery Counties and the entire Philadelphia, PA area, KSTG is the obvious choice for every person and business in Spring Township, PA.
For individuals and companies based in Spring Township, PA who have a need for either Leisure or Corporate Transportation services, Kevin Smith Transportation Group is the only solution you need. KSTG’s Leisure division will often be seen sending out a Wedding Limo or Call on most weekends. Wedding Shuttles can be seen every weekend in Spring Township, PA, moving everybody from Bridal Parties to Wedding Guests, making sure everybody can celebrate safely without the worry of figuring out how they will get back to the hotel safely. If a Party Bus rental is on your list, let KSTG arrange the perfect vehicle. Looking for something more elegant like a Stretch Limo and have KSTG send one of our Luxury Limos to Spring Township, PA and pick you up. Ideas may arrange for that landmark birthday celebration to simply a bar crawl with a group of life-long friends. Whatever the need, if your night is starting or ending in Spring Township, PA, let Kevin Smith Transportation Group deliver you in style. Almost every business in Spring Township, PA will eventually have a need for professional Corporate Transportation services. It may be a one-time request for that VIP client to daily shuttle services moving employees back and forth from a regional rail station. Whatever the need, Kevin Smith Transportation Group’s fleet of Black Vehicles from Yukons to Cadillac’s are the perfect choice for those focused on Luxury and Quality. Airport Transportation is a common service request with Philadelphia International Airport (PHL) located so close to Spring Township, PA. With more than a dozen International Airports in the Mid-Atlantic area, many companies will utilize KSTG’s services for Airport Transportation to places like Newark international (EWR), Kennedy Airport (JFK) and other airports north and south of the Spring Township, PA area. Other that Kevin Smith Transportation Group offers companies in Spring Township, PA include Shuttle Services. What makes companies great in Spring Township, PA is their ability to recruit the best talent. That often means recruiting in non-traditional markets. With KSTG’s Shuttle Services, many companies today have expanded their target markets to locations up and down SEPTA’s regional rail lines, providing employees with an easier commute. After a long day at work, getting a chance to relax in the back of a KSTG shuttle and being dropped off at the rail station for a traffic-free commute home is setting apart those companies in Spring Township, PA who are leveraging this employee perk. In addition, many companies in Spring Township, PA have employees or clients who will be traveling from outside the region. Whether it is Philadelphia International Airport or a local FBO like Wings Field, Northeast Regional Airport or Doylestown Airport, KSTG has a fleet of Luxury Cadillac XTS’s and Black Yukon’s to make sure your visitors are delivered on time and safely. Most companies in Spring Township, PA have begun to institute strict Duty of Care requirements around ground transportation, not allowing their employees to use any unregulated apps. This means that a company like Kevin Smith Transportation Group, with a highly skilled, licensed and screened staff of chauffeurs, becomes the perfect option for any company in Spring Township, PA who wants to offer their employees a safe and reliable transportation option. Black Car service is more than just a late model black vehicle. It is about providing a custom chauffeured experience where safety and luxury don’t have to be sacrificed. Spring Township, PA has been a key contributor to the success of Kevin Smith Transportation Group. An award winning company since its inception, KSTG delivers daily to both individuals and companies across Spring Township, PA. So whether it is that once in a lifetime event that needs to be perfect or just a routine trip to the airport, let KSTG be your total ground transportation solution. Today, KSTG is Spring Township, PA’s #1 Transportation Company and as we continue to grow, the entire team at KSTG is excited to see where that success will take us. So for those who use us regularly or just once a year, thank you for making KSTG the company it is today. Spring Township, PA is a township in Berks County, PA. The population is estimated at 27,119, making it the second most populous municipality in Berks County after the city of Reading, PA. In 1850, the Township of Cumru included about 33,000 acres of land with a population of 3,853 making it the most populous district in the county outside of Reading. In area, this was the largest township. In the decade before, two unsuccessful attempts were made to divide Cumru on account of its great extent. In 1850, a third attempt was made. The petition called for a division line situated to the west of the line requested in previous petitions, beginning at the “Harrisburg Bridge” and extending southward to the Lancaster County lines, at the corner of Brecknock Township, and it was inscribed by only 45 taxable inhabitants of the township. The court appointed Aaron Albright, Richard Boone and Michael K. Boyer as commissioners to inquire into advisability of the proposed division. 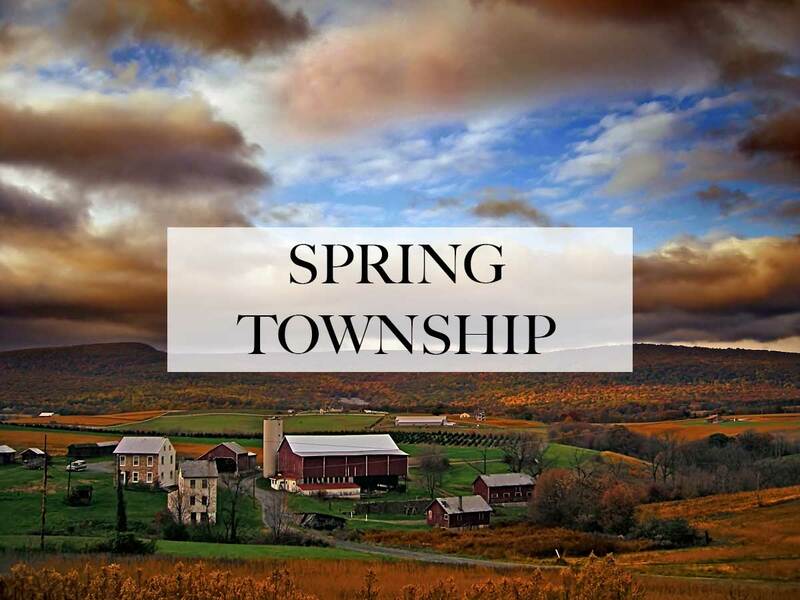 The commissioners, after viewing Cumru Township, divided it and recommended the western part to be designated as a new township under the name of “Spring”. The name was derived from a large fresh water spring in the central portion of the area. Because of the limestone fissures under the ground, the spring periodically appeared and disappeared. The early settlers, who used it for their daily water supplies, referred to it as the “Sinking Spring”. The Boundary lines of the township were described as enclosing some 15,000 acres. The report was presented for these boundaries on August 5, 1850. The Court confirmed the report on November 23, 1850 and formed the new township calling it the Township of Spring. Wertz’s Covered Bridge was added to the National Register of Historic Places in 1978. Wertz’s Covered Bridge, also known as the Red Covered Bridge, is a historic wooden covered bridge located at Bern Township and Spring Township in Berks County, Pennsylvania. The bridge is a 204-foot-long (62 m), Burr Truss bridge, constructed in 1867. It crosses the Tulpehocken Creek. It serves as the walkway entrance to the Berks County Heritage Center, which also includes the Gruber Wagon Works. It is one of five covered bridges remaining in Berks County. It is the largest single-span covered bridge in Pennsylvania. The bridge was rehabilitated in 1959 from 10 April to 3 August, however, when the Warren Street Bypass opened the bridge was closed permanently on 23 October 1959. It was listed on the National Register of Historic Places on 17 November 1978. From June until December 1984 the bridge was restored. The siding was replaced, several floor boards were replaced, it was jacked up, realigned, tightened, camber restored, and the rotted arch ends were replaced along with cedar roof shingles.